The Tempo Queen Storage Bedroom Set is a contemporary set with clean lines and modern style, bringing both elegance and functionality to complete the décor of any bedroom. This great transitional set, is made with Asian hardwoods and oak veneers, and features a rich wood finish with a wire brushed flat mocha color tone, oxidized pewter contoured hardware, and dovetail and sealed drawer boxes, making the Tempo Collection an excellent selection for any home. This Bedroom Set includes the stylish Queen Headboard, Footboard, two Side Rails, the Dresser with Mirror and a Nightstand. Consider adding the Tempo Chest and enjoy the complete collection, or mix and match the pieces of this beautiful set to better fit your bedroom. The Tempo Collection, quality crafted with modern style for the bedroom of your dreams! 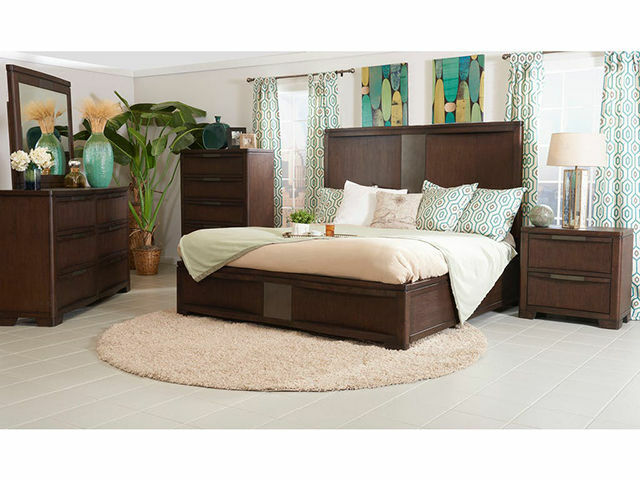 The Tempo Queen Storage Bedroom Set is a contemporary set with clean lines and a modern style, featuring Asian hardwoods and oak veneers, a rich wood finish with a wire brushed flat mocha, oxidized pewter hardware, and overall quality craftsmanship, making the Tempo Collection an excellent selection for any home.